Something is going on in the videogame industry, something never seen before. I remember a time, not so long ago when gamers were searching the net for information related to their favorite games. They seek the latest trailers, the latest screenshots or the latest interview. Videogame enthousiasts were having game icons like Mario, Link, Sam Fisher or the Prince from Prince of Persia. That was the past. Today, there is a new modern icon and she is taking the videogame industry by storm. 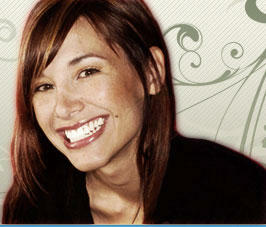 Her name, Jade Raymond, game producer. How not to fall in love with this new gaming icon? Well, first of all, you got to admit it, she's very beautiful... strikingly beautiful. Her beauty is just the tip of the iceberg though, there's alot more to her, that is her wonderful personnality and her immense charisma. There's no way you won't get seduced by her personality, she's magnetic. Jade really like people and it shows, she is very comfortable when she gives interviews and her naturalness and simplicity in front of the camera is astonishing. The forever smiling and laughing Jade is still the same humble and warm Montreal girl.